In February this year, a man who used to be one of the world's greatest jugglers celebrated his 60th birthday. Rudy Horn made an occasion of it by holding a big birthday party in a hotel in his hometown of Berchtesgaden in southern Germany. The guest list included some of the big names in the world of art and culture. Rudy Horn's feats, many of which he pioneered, were too exceptional for them all to be listed here, so here is no more than a brief sketch of his extraordinary skills and his career. He is remembered for his seven ball bounce off a drum, or for balancing coffee cups on his head on a tall unicycle, kicking them up with his foot, and finishing off with the spoon and a lump of sugar. He also juggled seven rings while balancing a champagne bucket on his head. 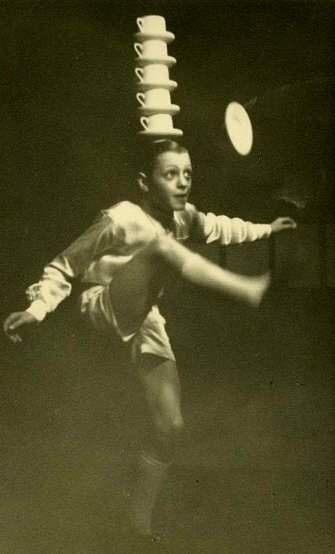 He started performing at the tender age of 11, alongside his grandfather who was also a juggler. From there, his career took him around the world, and in 1962 he was awarded the Rastelli Trophy, the highest honor for a juggler. In 1975 an Achilles tendon injury forced him to exchange his juggling props for a tennis racquet, and now he has settled down to working as a tennis coach in Berchtesgaden. As a birthday surprise, the BGL (Berchtesgadener Land) Juggling Dream Team (comprising "Begnackte Körper", "Duo Hackfleisch" "Picco Bällo") put on a specially rehearsed birthday show. In particular, the Rudy Horn tap dance might attract a few imitators once it has made its appearance at conventions. After this spectacular show, Rudy was presented with the first ever "Golden Teaspoon" award for his outstanding service to the art of spoon balancing. Rudy Horn admitted that this was the most unusual prize he had ever received, after the Golden Clown from Monte Carlo. Of course the guests insisted that he gave a short demonstration of his juggling ability (he's still pretty hot stuff with 7 balls on the drum and in the air), but by then it was getting late so he was allowed to get on with enjoying his birthday celebrations. We wish this highly likable artist all the best for next 60 years.